1) Regarding the installed version of WRC (scilicet the uninstaller version): DON'T REMOVE c:\users\user-name\appdata\roaming\wise registry cleaner\backup folder and the files in it. 2) POSSIBILITY to select/tick/tap/check all found problems in a section and ignore them in one click. Better: select part of the entries to ignore and ignore them in one click. 4) Command line parameter to defragment the Windows registry ONLY. 1, In fact, when user uninstall WRC, we will ask user whether to remove config files. I guess most user don't read it and click "Yes" to continue uninstalling. 2, Sorry, i cannot understand you. can you describe more? 3, If you ignore all sections, why do you run WRC. I think this feature is not necessary. 4, It is a good idea, i will let our tech dept. know it. When there are a lot of entries that an user wants to ignore, he is obliged to ignore them one by one. The user could ignore a full section, but better than this would be to choose the items to ignore (like ctrl + click in Windows), then ignore them in one click. Probably it is not necessary on WRC, BUT, IF I understood correctly, WRC is integrated into wise care 365. An user could prefer to not use the registry cleaner function, when using Wise care 365 - indeed the same behavior appears in IT! It sounds like some users need this function, I will report it to our tech dept. It seems that user can custom full checkup items. Right? We will consider it. Furthermore I start Wise Registry Cleaner from USB flash drive and use it on multiple computers. So I need another backup file name part to distinguish backups for the different computers. Change backup file name, it is nice! We will consider it. 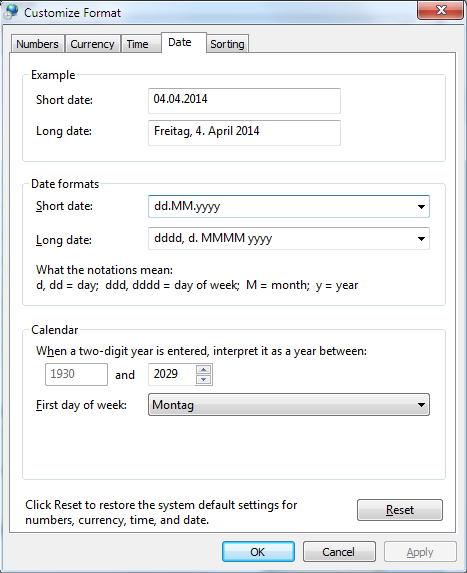 But the date format, I think it depends on your system date format. If your system date format is yyyy-dd-mm hhmmss, so Wise Registry Cleaner is same. If you want it display yyyy-dd-mm, you need to change system date format. Control Panel-->Clock, Language, and Region-->Set the time and date-->Change date and time-->Change calendar settings, change Short date and Long date. I think your suggestion is NOT correct (at least unter 64bit Win7). Have a look at the following snapshots of my date settings and you will find a third, different format. 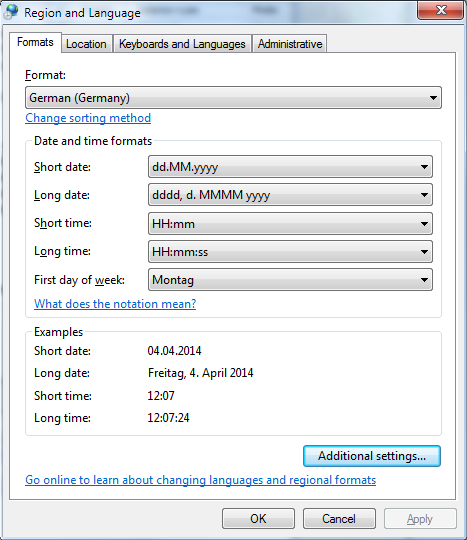 I have an english Win7 but german regional settings. 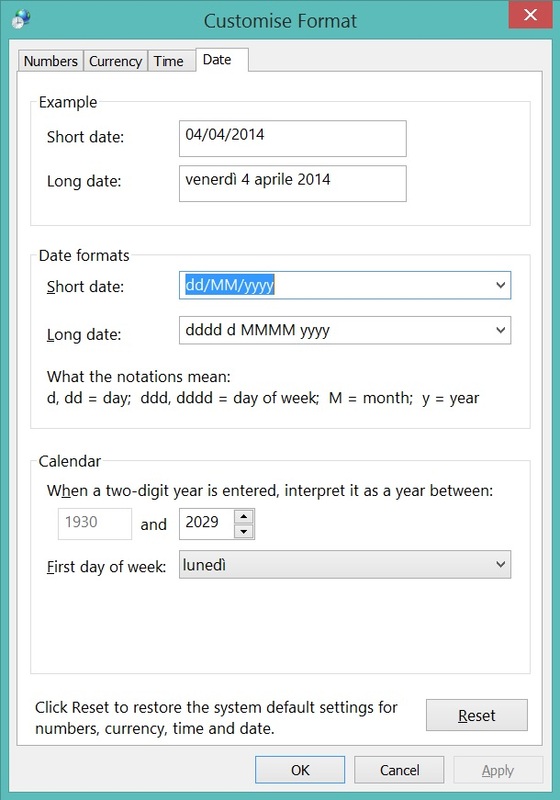 But the date format here is neither yyyy-dd-mm nor yyyy-mm-dd. So Wise software must get the info from somewhere else. 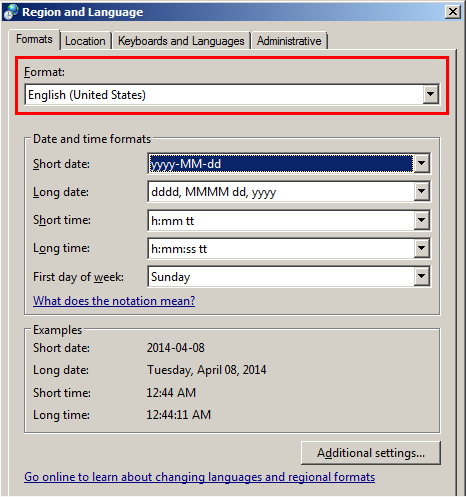 Indeed German(Germany) format has no yyyy-dd-mm nor yyyy-mm-dd. So, if you like yyyy-mm-dd, you'd better to change Formats as English. 1) A Germany user, his system format is dd/mm/yy, and he like this, if wisecleaner change to yy/mm/dd, he would not like it. Different user of the world have different preference. So system settings is the best choice. 2) When you use wisecleaner to backup registry, or when its auto-clean task is starting, it popup a window to let you set up date formats, then start to backup or start clean. This kind of customer experience is so terrible. the key fact is that yyyy-mm-dd is the natural sort order. Meanwhile I have 20 Registry backups and I need a sort. Regional settings are for human readability which is not important here. That should beimplementable without much effort. Even more no user is prompted with something. Could you add it (in addition to the previously suggested computer name prefix)? I will send your suggestions to our team (name of backup file, custom date format). When you have any suggestions of wisecleaner, please let me know. I have ALOT of entries that are Missing links, instead of ignoring them, we should be able to delete them. Is this even something that can be done? Because just ignoring them does not clean the registry but deleting them will. Command line parameter to defragment the Windows registry ONLY. Custom area: replace the scan button with the save button, to save the choices. I'd also prefer its previous location (bottom-left corner). When I/we click the top-right X, the choices won't be saved. POSSIBILITY to select/tick/tap/check all found problems in a section and ignore them in one click. Better: select part of the entries to ignore and ignore them in one click; i.e., introduce arrows, CTRL+click and SHIFT+click functionality. Your competitors have got this functionality in their programs. When there are a lot of entries that an user wants to ignore, he is obliged to ignore them one by one (right-click on a item, left click on ignore, right-click on a item, left click on ignore, right-click on a item, left click on ignore, right-click on a item, left click on ignore, right-click on a item, left click on ignore, right-click on a item, left click on ignore, right-click on a item, left click on ignore, and so forth: imagine this procedure for a thousand of items...). 1. Command line parameter to defragment the Windows registry ONLY. The developer team told me, Command line to defrag Windows registry is not impossible, because the defragment need a GUI interface to tell user time left and block user I/O operation. 2. Custom area: replace the scan button with the save button, to save the choices. Scan, user only need 1 step to scan using custom settings. But, Save, user need more steps, at least 2 steps, save settings then click Scan button. If you don't want to Scan immediately, just click top-right X to save and exit. Thanks for your feedback, if many user don't like it, we will change it. Thanks, but, how many entries do you want to ignore in normal use? I think the number may less than ten, only a few user may be over ten entries. If a user want to ignore a full section, he can add the registry key into exclusion list. I think it would be better than ignoring entries one by one. So, we can add this function, but I think it is less useful, only a few user will use it in a special situation. If many user want it, we will add it. Did you want to write "is not possible"? Otherwise, I didn't understand. If you don't want to Scan immediately, just click top-right X to save and exit. The problem about the top-right X is that it won't save the settings (I tried it, with portable version... I didn't try with the installed version). If the X could save the settings, then there will be no problems. By the way, it isn't quite clear if using the scan function inside the custom area will use the normal/safe scan or the deep scan. how many entries do you want to ignore in normal use? I think the number may less than ten, only a few user may be over ten entries. If a user want to ignore a full section, he can add the registry key into exclusion list. I think it would be better than ignoring entries one by one. I excluded actually 382 items (in WRC), one by one. The problem arises when using the program for the first time (and following times): when I'm trying a new registry cleaner, the first thing I check is if I can exclude entries I don't want to delete/kill/erase/remove. And to exclude hundreds of entries one by one could be very annoying. After the first session, when I excluded the most, I excluded very few items from time to time. Hence, IMO, it could be useful for new (intermediate/advanced) users, or old users that are reinstalling the software, or that are installing the software on another machine. Sorry, I typed wrong words. Yes, I means we can't do it - defrag registry using command line. The top right X button, there is minor bug, if you click Recommended then click X, it won't save settings, but if you select / deselect items, then click X, it will save settings. Okay, I will send it to the developer team. The top-right X problem seems to be already fixed in the last version, 9.15.589. I tried putting this in the Suggestions pinned thread, but was having no luck with it posting. Anyway ... I started using Wise Registry Cleaner and Wise Disk Cleaner a couple of months ago. They both immediately became 2 of my favorite tools. It was even more so a bonus that there were PortableApps.com versions available so that I could carry them around in my Flash Drive in my PortableApps.com platform. However, recently I was really taken aback, really bummed out with the new GUI style and direction of Wise Registry Cleaner. IMO, I think Wise Registry Cleaner is going in the wrong direction with this new GUI style. Right now I have my PortableApps.com platform stuck at the old 8.83 Wise Registry Cleaner version because that's the last version that had the previous GUI style, which I much prefer. IMO, the old GUI style presented MORE details and right there in the original window. I don't like how in the new GUI style you have to click on an item to then bring up that 2nd window and then at that ... the info / details have been watered down / censored. Now the info is more generic. With the previously more detail info from the old original GUI style, it provided one with more specific data as to the content of the found items in the scans so as to much better decide what to delete and what not to delete. The generic info provided by the new GUI style in Wise Registry Cleaner now reminds me of JetClean. I also use JetClean and it provides tons of info, but by the same token, a ton of that info is very generic. It doesn't give one remotely enough data with which to decide whether a lot of those items found in the scans are safe to delete or not. It would be great and really appreciated if at the very least there was an option incorporated into Wise Registry Cleaner similar to the new Wise Disk Cleaner whereby we can select the NEW Mode ... or CLASSIC Mode. I merged your topic with the feature requests. I made your same request when WRC v9 was in its beta stage. It was even more so a bonus that there were PortableApps.com versions available so that I could carry them around in my Flash Drive in my PortableApps.com platform. I think that's unnecessary: the portable version of WRC is present on wisecleaner download webpage and by the way you can create a portable version directly from WRC installed version. So do you think there's a remote possibility that they COULD conceivably incorporate that option of selecting Classic mode? As to the WRC portable version vs. the PortableApps.com version? I always prefer to use the PortableApps.com version of ANY Apps because I like / prefer the easier / faster install sequence of the PortableApps.com versions. You know ... given that they're going to be installed on the PortableApps.com platform. I just double click on the install files and BAMM! The install sequence is initiated and quickly finished. There's no need for unpacking a Zip file, selecting files, Etc. Like especially when periodically formatting my Flash Drives and installing everything from scratch upon a new PortableApps.com version being put out ... the install of all the PortableApps.com versions of Apps goes way more speedily than the install of my various portable Apps that are not PortableApps.com versions. Plus, if my memory serves me correctly, I believe that the WRC portable version of Wise Registry Cleaner when it's installed on the PortableApps.com platform ... displays the title as something along the lines of "WiseDiskCleaner.com" as the title of the selection choice there in the menu of my PortableApps.com platform instead of "Wise Registry Cleaner." I don't know why WRC would do that given that it makes for a vague, confusing title that isn't correctly descriptive of what clicking on that selection will bring up. The WRC portable version of Wise Disk Cleaner DOES correctly have the title of "Wise Disk Cleaner" there in the menu of my PortableApps.com platform. 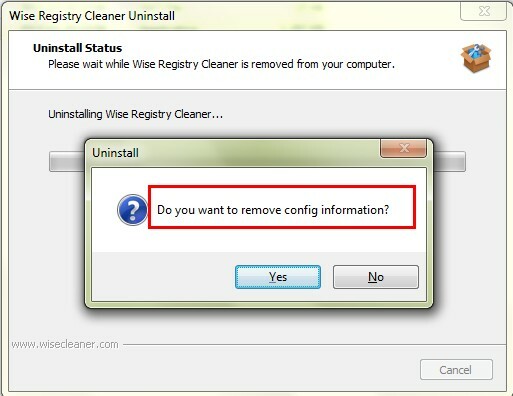 So, IMO I think it would be a much better idea to change the title of the selection choice to "Wise Registry Cleaner" there in the WRC version of Wise Registry Cleaner instead of it generically displaying "WiseDiskCleaner.com" or whatever it is that it displays. The more users request it, the more the probability they change it grows.